On this page you can configure when Easy2Sync should ask before performing an operation. Create file: Easy2Sync asks before creating a file by coping it. Create directory: Easy2Sync asks before creating a directory by coping something. Overwrite file: Easy2Sync asks if an existing should be overwritten with a more recent version. Since only one of the files has changed since the last synchronization it is quite safe to perform this synchronization. 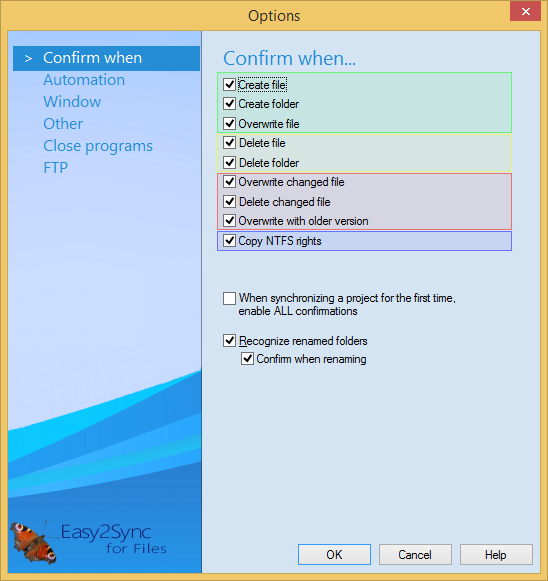 Delete file: Easy2Sync asks before a file is deleted because this file was already deleted on the other computer by the user. It may be risky to deactivate this request since files may be lost. Delete directory: Easy2Sync asks before a directory is deleted, because this directory was already deleted by the user on the other computer. A directory is only deleted by, if it is already empty, meaning that it contains no files or subdirectories. Overwrite changed file: Easy2Sync asks if an existing file should be overwritten with a more recent version. In this case both files were changed since the last synchronization and it is recommended that the user should manually check whether the more recent file really is the better one. It is dangerous to deactivate this request since Easy2Sync only judges the files by their date in this case. Delete changed file: Easy2Sync before it deletes a file since this was deleted by the user on one computer and changed on the other. The user should check if he really wants to delete this file. It is therefore risky to deactivate this warning. Overwrite with older version: Easy2Sync asks if an existing file should be overwritten with an older version of this file. Only one of the files was changed and it is now older than it used to be. Possibly this file was taken from a backup. Copy NTFS rights: If you change file rights, but not the file itself, this can be synchronized, too. If you activate this option, no confirmation request will be issued. If the file is copied because of a change, the rights will always be copied. All this only applies, if the NTFS rights were activated in the options. When synchronizing a project for the first time, enable ALL confirmations: When a project is synchronized for the first time, different rules are used. Files won't be deleted, for example, but copied to merge the two directory trees. Therefore it is recommended to confirm ALL messages when synchronizing the first time to avoid problems. Confirm when renaming: Easy2Sync can renamed directories and mirror that behavior. This can greatly speed the sync process, since much less copying operations can be needed.